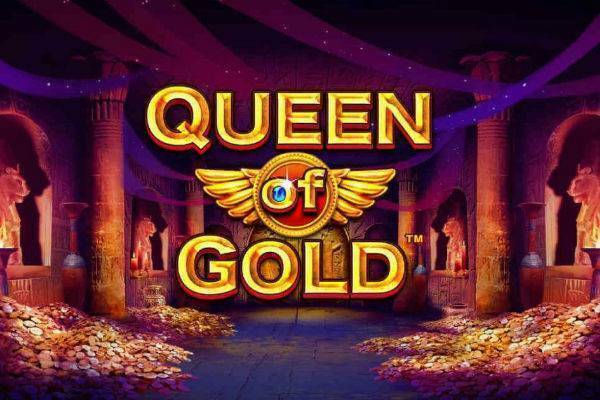 Queen of Gold is another fine addition to the world of Egypt-themed video slots. We know, there are already tons of Egypt slots out there. However, hold your cynicism, because this game from Pragmatic Play truly stands out from the pack with its range of special features. Right from your very first spin. This is a 6 reels, 25 payline game, with the 6th reel being a reel of multipliers, and that’s just in the base game. There are also different levels you can move up, along with free spins and a progressive game at the end. Take a look at this treasure at one of the casinos recommended on our site. To set your bet in Queen of Gold, go to the Spin button that’s to the right side of the game screen. Next to it, you’ll see small Plus and Minus buttons. Tap on those and you’ll open up the menu to adjust your bet size. The 25 paylines are always active, so you just have to adjust your coin value and the number of coins you’d like to bet on per line. Coin value ranges from just £0.01 to £0.50, and you can bet 1 to 10 coins per line. Since you’re betting on all 25 lines, minimum bet per spin starts at £0.25. It’s not a penny slot, but we think it’s worth every penny with all those multipliers in store. In Queen of Gold, you collect points to move up the 6 levels, each with higher multipliers and better prizes. Now, it’s worth noting that changing your bet value in the middle of the game in Queen of Gold will reset your level and points, so try to set your bet size to something you’re happy with right from the start! We’ll say outright that the fixed jackpot won’t be much in Queen of Gold. Spinning 5 Cleopatra symbols will land you 200x your bet per line. If you’re playing at £0.05 a line, that’s £10. But the point in playing Queen of Gold is that you’re practically never just in a base game. With the 6th reel filled just with multipliers, up to a maximum of 100x, you can be looking at a pretty solid win, even when you don’t hit the jackpot. Multiplier Reel: There are 6 reels in this game, and the very last reel being a reel composed of multipliers. While there is a rare 1x multiplier (and only at Level 1) that won’t do anything, there are already enough 2x, 4x, 8x multipliers early on. We say “early on” because the multipliers get higher the more you play. That means your wins will almost always be higher than the prizes listed in the base game. Progressive Game: At the top of the game screen, you’ll see that there are 6 levels (Levels 1 to 5, plus Super). You can collect points to move up the levels, which have bigger prizes the higher you get. To collect points, use the golden ring to select a spot in which Cleopatra would land on. If you’re right, you win a point. If you collect 5 points in 25 spins, you can move up a level. Alternatively, hit the Joker button when it pops up on the 6th reel of multipliers. A word of caution – changing your bet value while you have points will reset everything to the bottom. So choose your bet size carefully before you start getting carried away! Bonus: Spin 3 of the Bonus symbols (the diamond pyramids) and you will enter the Free Spins bonus round where you’ll get 10 spins. Free spins can be retriggered and are unlimited! Queen of Gold is a beautiful game. The colours are bright and vibrant, and the symbols are drawn in detail. As the rickety reels spin away, your wins will be celebrated with magical flourishes with the Queen blowing kisses every time you collect a point. As you move up a level, Cleopatra glows and floats up the screen, and you’ll move into a different Egyptian landscape. It’s all accompanied by a low key, Oriental soundtrack to keep you in the right groove. We know there are tons of Egypt games out there, but Queen of Gold is simply a must try. Not only is this brightly and beautifully animated, but it’s filled with an extra reel of multipliers that can give your wins a bump up with every single spin. It’s also surprisingly fun to guess the landing spot for Cleopatra with the golden ring and collect points. RTP for this game is at 96.5%, so you should be seeing wins pretty frequently along with those multipliers. Give this game a spin at one of these top online casinos.